There is more to burlesque than the saucy vintage tease – explore more of the elements that make good performers GREAT with the Lady Velvet Cabaret Burlesque Series! 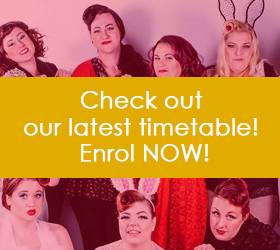 The Burlesque Series is an ever-changing selection of quality small-group burlesque classes instructed by prolific performer Sugar du Joure, Miss Burlesque WA 2016, and Miss Burlesque Australia 2016 1st Runner Up. Sugar has toured the world performing her unique and charming routines alongside some of the world’s biggest names in burlesque, and is a legendary teacher and mentor. Each course runs for approximately five-to-six weeks depending on the term, and will explore a different theme or aspect of the art of burlesque. Past themes include Little Shop of Horrors, Moulin Rouge, Latin fusion, comedy and character, and even targeted courses developing skills required for entry into burlesque pageants and competitions. Generally, this course is suitable for all levels – from beginner to more experienced, depending on the theme and focus. Included in your course costs is the opportunity to perform at one of our famous LVC Graduation Showcases, alongside our professional artists and special guests. 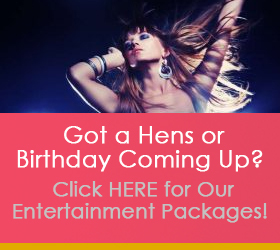 Enrol below or for more information please fill out the enquiry form or email info@ladyvelvetcabaret.com.au. To be added to our VIP Burlesque Series mailing list, for a personal update when each course is announced, please email us or complete a contact form! Do I have to perform at the end of the course? Not at all! Performance is completely optional, and you can always do a few courses and wait until you are ready before you head for the stage. However we do encourage you to perform eventually, as the stage experience will help you understand a lot of the performance fundamentals we teach in the course! No, sorry! This class runs for a limited time only and each week covers a different theme or topic. Unfortunately due to the short length of the course, each week is very important for the final performance, so no casual attendees are allowed. We encourage you to dress the part! Come in your full Burlesque, vintage or pin-up outfits to fully immerse yourselves into the glamorous world of tease! All payments are due in full at least 7 days prior to the commencement of the course in order for your place to be secured. You can pay online 24/7 using your student portal account (if you need help logging in, or have not received your invoice, please email us for assistance). Please note that last minute cancellations (5 days or less notice before workshop day) cannot be refunded or offered a credit – all bookings are finalised at this point to ensure the sessions can go ahead as planned.